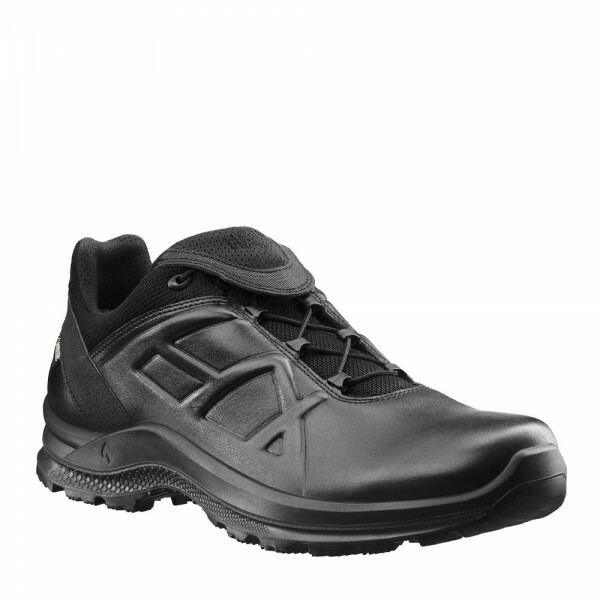 Product information "HAIX Black Eagle Tactical 2.0 GTX low/black"
The Black Eagle Tactical 2.0 black GTX by HAIX is a weatherproof leather shoe which is able to match up to any challenge you may encounter in your working life or free time. It provides total comfort of wear whilst giving the foot all the protection it needs. A robust outsole reliably prevents any penetration of oil or petrol whilst insulating against heat and cold alike. A special lacing system moulds the shoe to the foot to avoid any pressure points or slipping. A comfortable inlay sole cushions every step you take to guarantee the best possible shock absorption and to eliminate any pressure on the joints and spine. Even after a long and strenuous day, your feet will remain totally fresh. This is a robust and extremely light shoe which is ideal for police officers and soldiers undertaking long periods on duty. Its weatherproof properties and high breathability also make it a very good option for leisure activities. The Black Eagle Tactical 2.0 is a comfortable and slip-resistant shoe with a deep tread. It provides a firm foothold across mud, snow and rough terrain and is equally able to cope with icy and oily surfaces. The outsole is manufactured in a special highly resistant rubber compound. This ensures a long product life as well as offering a host of other practical benefits. The sole insulates against heat in the summer and against the cold in winter. Safety is a further important aspect, and resistance against hazardous materials such as oil and petrol is also provided. In addition, the Black Eagle Tactical 2.0 is also completely antistatic due to the fact that no metal is used in the manufacturing process. Strenuous work or leisure activities can leave you in a sweat. The leather used in the Black Eagle Tactical 2.0 features special reflecting pigments to prevent unnecessary heating of the shoe in sunlight. The GORE-TEX® membrane of the shoe’s inner lining is highly breathable. This means that heat is dissipated rather than being stored internally. At the same time, the shoe is also fully waterproof. No moisture is able to penetrate, leaving you fully equipped to cope with any weather conditions. A comfortable quick-dry inlay ensures effective climate control by absorbing fluids such as sweat and preventing any unpleasant odours that may be caused by bacteria. The inlay may be removed and washed at 30 degrees if required. Despite its lightness, the Black Eagle Tactical 2.0 is a robust shoe that can be deployed across a wide range of work and leisure areas. It performs equally well in stifling indoor spaces and on icy winter roads. This is a comfortable leather shoe that affords your feet all-year round protection. The black material used reflects the sun’s rays to generate a cooling effect. This means that less heat is transported to your feet. A special quick lacing system moulds the shoe to the foot to provide a perfect individual fit that lasts all day long. The laces themselves are tucked away in an additional pocket to ensure that they cannot catch on anything. The Black Eagle Tactical 2.0 is available in black. It is also completely antistatic due to the fact that no metal is used in the manufacturing process. A three-ply GORE-TEX® membrane prevents any moisture from penetrating into the shoe. This is also a highly breathable material which reliably expels any internal moisture. The fabric of the lining is particularly abrasion resistant. It offers the optimum degree of climate comfort throughout the year by cooling your feet in summer and warming them in winter. The shoe’s fast-drying inlay sole absorbs sweat and provides an anti-bacterial effect. This means that no unpleasant odours can arise. A special heel cup provides additional support and stabilisation to ensure that you do not go over on your ankle. The bold tread of the outsole is made from a robust rubber compound and offers superb slip resistance. This guarantees a firm foothold, even when moving over rough terrain. The rubber sole has the benefit of ensuring a long product life as well as insulating effectively against heat and cold alike. It is also resistant to hazardous liquids such as oil and petrol. In addition, the sole leaves no black marks on surfaces such as light-coloured tiles or sensitive floor coverings. The weatherproof Black Eagle Tactical 2.0 by HAIX is a shoe for everyone seeking protection and comfort in any situation. Its waterproof yet highly breathable material delivers a feel-good factor for the feet throughout the year, regardless of whether you are indoors or outside. This is the perfect shoe for any work or leisure activity. Place your order now!